Manijeh’s trial began on March 6. On March 27, she continued her cross-examination of Supreme Court Chief of Police, Jeffery Smith. Acting as her own attorney (pro se), she asked carefully constructed questions making the point that the charged offenses, and subsequent treatment during over 24 hours in police custody, were far harsher than the defendant’s nonviolent conduct warranted. Saba: Was it standard procedure to arrest me? Smith: Yes. Saba: Did you know they would hold me overnight? Smith: Yes. Saba: Was it standard procedure not to have a phone call? Smith: I can’t answer that. Saba: Was it standard procedure not to have enough clothing? ….. My outer garments were removed and held, and when I was released from jail without any ID or money I had to find my way back to the Supreme Court without winter garments. Smith: That was transport. I cannot speak for what happened. Firstly, the law is too broad, as Chief Judge Howell articulated [in Hodge v. Tarsi]. The law is intended to ensure decorum and prevent disruptive demonstrations that would prevent ingress or egress to the Court, which did not occur in this case. Therefore, a conviction for being behind a banner on the lower steps is not in keeping with the intention of the legislature and is an improper application of this law. Secondly, the charge is for a de minimus violation which should not result in a conviction. There is no signage to indicate that you lose your first amendment rights at the temple of justice, the very place where such rights should be protected. There was no proper warning, since the police could have easily told us that we could lawfully demonstrate just a few feet away on the sidewalk. It is not proper for the police to say that the warning is meaningful, since they say “You are in violation of Title 40″ – am I really in violation of all several hundred pages of that title of the US code? Judge Robinson obviously understood the reasonableness of Manijeh’s MJOA and the importance of the First Amendment. After hearing the government’s and defendant’s testimony and reviewing the videotape of the arrests and arrest photos she concluded that the government failed to offer evidence that their purpose was for assemblage or display to bring into public notice a movement. Moreover, she stated that there was no proof that Manijeh was in a nexus with the people on the sidewalk who were protesting Guantanamo. I engaged in a peaceful, inspiring demonstration against unending bombing and killing of Yemenis that our government supports. 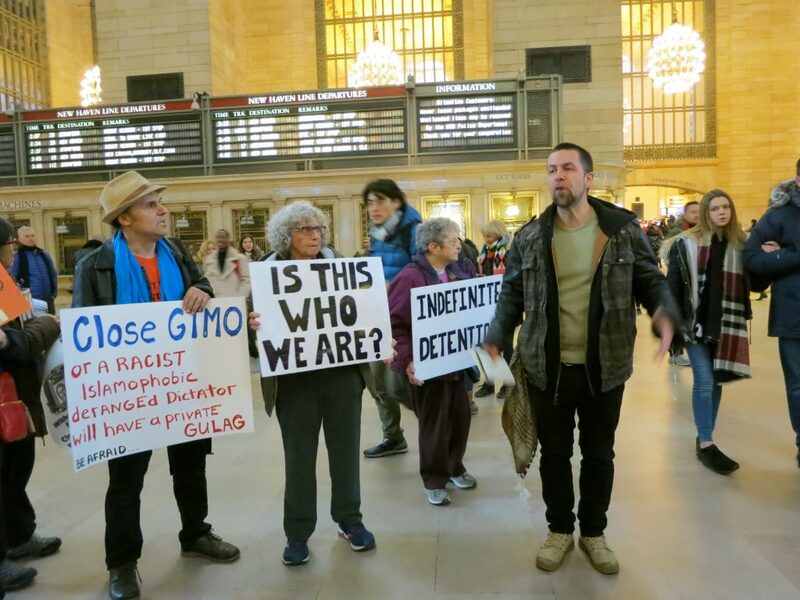 With respect to Guantanamo, I was protesting the unlawful detentions and demanding the release of five Muslim men who have been approved for release, and 32 Muslim men who shouldn’t have been detained in the first place, as determined by the courts. I was standing on the safe public grand plaza of the Supreme Court. I crossed no barrier or barricade. My conduct was heartfelt and peaceful in defense of my inalienable right to speak for peace and Justice. Therefore, it did not seem reasonable to me for the officer to stop us from speaking out peacefully by arresting us. Manijeh Saba’s trial in U.S. District Court for the charge of protesting on the steps of the Supreme Court began on Wednesday March 6th. On January 9, she and four others were calling out the U.S. government’s complicity in war atrocities against the people of Yemen as well as its ongoing torture of Muslim men at Guantanamo Prison. They were arrested on January 9, but charges were dropped against three others and Joanne Lingle pleaded guilty. Early in Wednesday’s proceedings Manijeh fainted, and Judge Deborah A. Robinson scheduled a continuation of the trial on March 27 at 10:30 in Courtroom 4 of the Prettyman U.S. District Courthouse, 333 Constitution Avenue NW, 2nd floor. Please come for support, if you can! Good Morning your Honor, I’m Manijeh Saba. Today, you will hear that I allegedly violated a law by protesting. I intend to show you that my actions were not illegal, that they were an exercise of my First Amendment Rights. I will ask you, at the end of this trial, to find me not guilty, because my conduct is protected by the First Amendment of our Constitution. I am a 72 years old Iranian-American mother, grandmother of three, and married to Majid Maleki for 46 years. I came to the United States in 1977 for graduate studies. I am a political sociologist with focus on women and development. I was born in Iran, in a military household during a short-lived, decade of burgeoning democracy whose life was cut short, thanks to the US-British coup d’état of 1953. Hence, I have experienced two authoritarian regimes in Iran, one that of the Shah, and the other the continuing brutal theocracy of the Islamic Republic. As a result, I know what it means to live under a dictatorial regime. As I remember, I have always been curious, asked questions, and pushed against unreasonable boundaries. Therefore, resistance against totalitarianism, regardless of where it exists, and however it rears its vicious head, is a fundamental part of who I am. I became a US citizen in 1996 and have voted in every election since then. As part of the citizenship process, I took the oath to “support and defend the Constitution and the laws of the United States of America against all enemies, foreign and domestic”. I have great respect for our constitution and carry a copy with me at all times. I took the pledge of nonviolent resistance and have tried to follow the path of Mahatma Gandhi and Dr. Martin Luther King who, in the face of violence, gave their lives in promotion of peace and justice. It is this background that has brought me before you today. On January 6th of this year, the 17th anniversary of the opening of Guantanamo prison, I joined Witness Against Torture for a week in Washington DC to fast, remember, and raise awareness about the 9 Muslim men who died in Guantanamo, and the condition of the 40 remaining in the extrajudicial trap of indefinite detention each for at least 10 years. Of the 40 Muslim men still detained there, 5 have been cleared for release, as not a threat to security. The US Federal courts have determined that 32 others are detained unlawfully. How could this happen in the United States? I could neither forget nor stand by, when innocent people including the hundreds who have already been released without charge from Guantanamo are targeted and tortured with no end in sight. Also, we spent the week remembering the horrific condition of the people of Yemen due to the US backed Saudi led coalition war since March 2015. This war is being fought with the support of United States Intelligence as well sale of bombs made in the United States. This forgotten war on Yemen has so far killed 146, 000 people, at least 70,000 of them children, and has displaced millions of people, causing a humanitarian catastrophe. On August 9th 2018 a Saudi warplane dropped a US made 500 pounds laser-guided bomb killing 40 school boys and 11 adults. And of the 79 civilians wounded by this bomb, 56 were children. 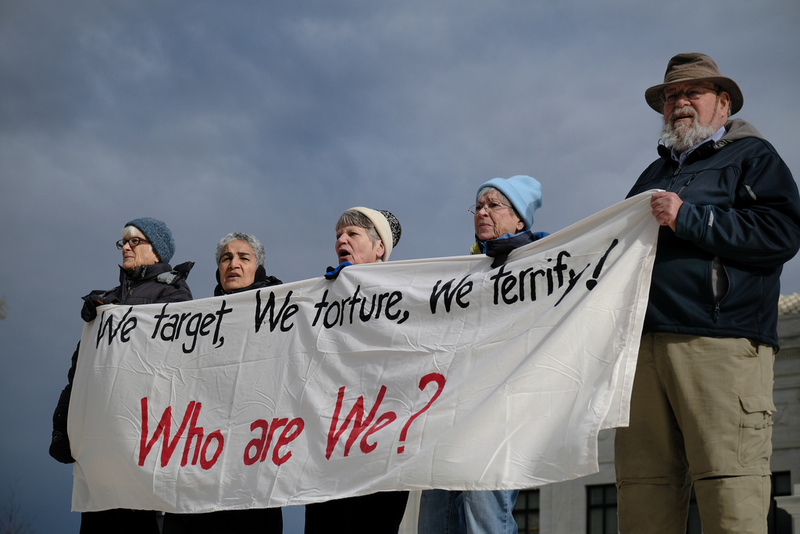 On January 9, we marched to the United States Supreme Court protesting all forms of torture and the on-going Guantanamo detentions, as well as the unending wars and mass destruction that our government is concurrently involved in globally, particularly in Yemen since 2015. 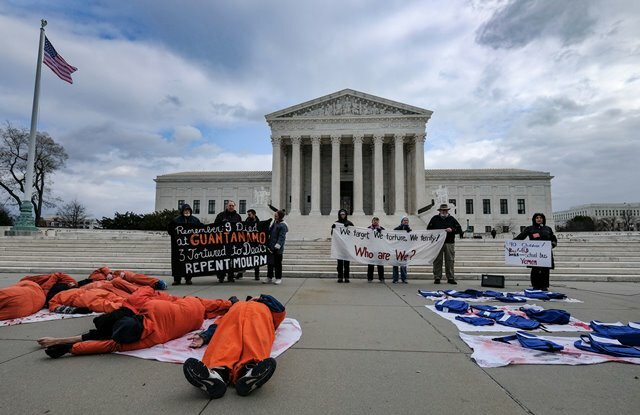 Dozens of us, members of Witness Against Torture, most in orange jump suits and black hoods, representing the Guantanamo detainees, arrived on the sidewalk before the steps of the Supreme Court in the early afternoon. We were singing and chanting, we carried signs and banners denouncing the United States-backed Saudi bombing of Yemen and called for the closure of Guantanamo. Several people in orange jumpsuits and black hoods laid down on bloodied shrouds on the sidewalk. We also placed 36 blue children’s book bags on a bloodied shroud, bearing names of the children killed in Yemen on a school trip. We Target, We Torture, We Terrify! Who Are We? A short while later, we who held the banner walked up the first few steps of the Supreme Court and stood on the grand front plaza. It was a place that was safe, open for us, and we posed no threat and or obstruction to anyone who would enter or leave the building. It was a very cold (about 35 degrees), quiet day with very little public activity on the front plaza of the court. We repeatedly sang the song, along with our group standing on the sidewalk at foot of the steps. I engaged in a peaceful, inspiring demonstration against unending bombing and killing of Yemenis that our government supports. With respect to Guantanamo, I was protesting the unlawful detentions and demanding the release of 5 Muslim men who have been approved for release, and 32 Muslim men who shouldn’t have been detained in the first place, as determined by the courts. I was standing on the safe public grand plaza of the Supreme Court. I crossed no barrier or barricade. My conduct was heartfelt and peaceful in defense of my inalienable right to speak for peace and Justice. Therefore, it did not seem reasonable to me for the officer to stop us from speaking out peacefully by arresting us. Nor does it seem reasonable that they did not offer us the alternative to speak out with others a few feet away on the sidewalk. There is nothing that distinguishes the sidewalk from the step. Around 1:00 PM I was arrested along with 4 other fellow protesters, and was taken to the basement of the Supreme Court for processing. I was not given a phone call. I was questioned after I said I did not want to speak without an attorney being present. And then, I was sent to jail overnight in terrible conditions before conviction. My experience in custody of the Supreme Court police of the United State was most unusual and shocking. I appear before Your Honor today, asking if the Constitution condones the arrest and jailing of five peaceably assembled protesters. It is my belief that it does not. That is why I was there that day and why I continued to protest. I will show the court throughout this trial that the law under which I am charged criminalizes peaceful demonstration of dissent, and therefore, it is a thoughtless affront to our Constitution and our values as Americans. I hope you will find that peaceful political protest is fundamental to our democracy and not a crime in our society. This is, who we are. Read to the court on March 6, 2019. The government then began its case by putting the Supreme Court Chief of Police, Jeffery Smith, on the stand. Manijeh was sitting down while cross examining him, as she wasn’t feeling well. Judge Robinson called a ten minute recess for her, but during that time Manijeh fainted. She quickly revived, nurses and paramedics arrived, examined her and asked if she wished to go hospital but she declined. After the recess Judge Robinson decided to schedule a continuation at 10:30 am on Wednesday March 27 in Courtroom 4 of the Prettyman U.S. District Courthouse, 333 Constitution Avenue NW, 2nd floor. Many local peacemakers were unable to attend on March 6 because of other events, including the annual Ash Wednesday service in front of the White House. Now everyone is encouraged to come to support on March 27th! We invite you to participate in an action on the morning of the Gina Haspel confirmation hearing. Last month, President Trump nominated Gina Haspel, the current Deputy Director of the CIA to become Director. Haspel is best known for overseeing a CIA black site in Thailand in 2002 where two Guantanamo detainees, Abu Zubaydah and Al-Nashiri, were waterboarded and tortured. Furthermore, Haspel was involved in destroying agency interrogation tapes – a move clearly designed to erase the possibility of transparency and accountability. Because of her involvement in torture, Haspel should be prosecuted Instead of rewarded. Thus, this action will be held on the morning of Haspel’s confirmation hearing with the goal of centering the Muslim victims of CIA Black sites in the War on Terror. The call will also be made for Congressional members to oppose her confirmation and to demand accountability for those who designed, conducted, oversaw, and/or implemented the CIA’s Rendition, Detention, and Interrogation program. Haspel’s promotion would be a direct endorsement of torture, sending that message both to governments that torture and to the people who endure horrific abuse. It was with heavy hearts that we, as members of Witness Against Torture, listened to Trump’s State of the Union address Tuesday evening. We heard him attempt to stoke fear in his listeners with wave after wave of references to terrorists and criminals. He began by linking terror to “illegal immigrants,” border walls, “chain migration,” and visa lotteries, before moving on to ISIS, Al Qaida, rogue regimes, unlawful enemy combatants and more. The prison at Guantanamo has always depended for its existence on xenophobic fear, fueled by racism and Islamophobia. Stoking this fear helps leaders aggrandize their power, as the history of authoritarian regimes has amply demonstrated. Witness Against Torture from its founding has sought to counter this hatred by recognizing the human dignity of each prisoner, beginning with our attempt to visit the prisoners in 2005, to fast in solidarity with their hunger strikes, and to lift their names, faces, and stories in the public eye and before the seats of power in Washington year after year. We have spoken up relentlessly for the right of every detainee to trial or release. And so we resolutely continue. We turn our eyes with hope to the major legal challenge to Donald Trump’s continued detention of the men at Guantanamo, filed by the Center for Constitutional Rights, Reprieve, and co-counsel on the 16th anniversary of the opening of the prison. We are deeply grateful to our friends and allies who continue to plan rallies and actions in support of closing the prison. 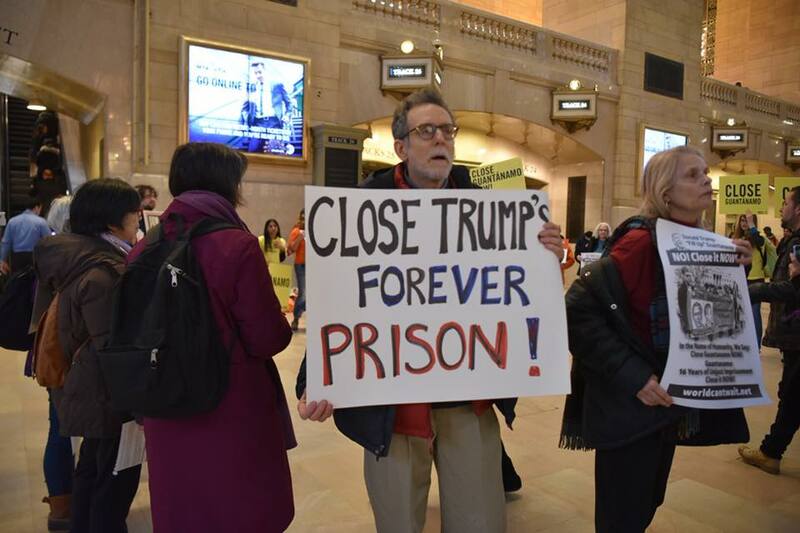 On Thursday, Feb. 1, human rights activists from Witness Against Torture, the Justice for Muslims Collective, World Can’t Wait, the Center for Constitutional Rights and other groups gathered at Grand Central Station to protest Trump’s recent Executive Order on Guantanamo. Announced in the State of the Union address, the Order directs that the detention camp remain open, reversing the policy of President Obama to try to close the prison. The camp at Guantanamo has been a place of torture and other gross human rights abuses. It continues to imprison 41 men — including 26 held without charge or trial and 5 whom the US government had already cleared for release. Trump’s policy also freezes any releases from the prison and orders that new captives can be brought there. Guantanamo remains a blight on the US Constitution, the rule of law and basic democratic values. Trump’s policy, as challenged in a lawsuit brought by the Center for Constitutional Rights, is based in his well-documented racism and Islamophobia. I refuse to participate in this criminal act. The nurse’s refusal is an extraordinary act of conscience. It speaks to the brutality of forced-feeding, which the hunger strikers describe as torture and medical and human rights bodies have denounced. It affirms the ethical obligations of medical professionals, which prohibit forced-feeding. And it underscores the broader criminality of Guantánamo, where men are held indefinitely without charge or trial and further brutalized when they protest. Witness Against Torture praises the heroic act of the Guantánamo nurse, who should not suffer disciplinary consequences for his principled stand. We hope his act inspires other staff at Guantánamo to refuse to execute camp orders. Most of all, we hope the nurse’s resistance further awakens the American people and President Obama to the barbarity of Guantánamo and hastens the closure of the prison. Refusing food is among the only means the detained men have to protest their indefinite detention and abusive treatment. Such treatment includes the defilement of the Quran, genital and body cavity searches before and after leaving their cells, being beaten by Forcible Cell Extraction teams when taken from cells, and being held in solitary confinement for months and even years. Rather than addressing these grievances, President Obama has allowed the continuation of forced-feeding — a tactic the military admits is intended to break the 18-month-long hunger strike. The procedure, while couched in secrecy, is shockingly violent compared to medically warranted tube-feeding. As described in letters from detainee Emad Hassan, the hunger striker is strapped into a restraining chair, often tightly around the abdomen. A tube larger than one used for standard nasogastric tube-feeding is forced through delicate nasal passages, down the throat, and into the victim’s stomach. Nutritional supplement, at times containing medication or water, is injected rapidly in large quantities into the stomach, sometimes causing nausea, vomiting, and abdominal pain. The tube is then removed — and is sometimes yanked quickly from the nose, causing trauma in the nasal passages. Dhiab’s lawyers are challenging his forced-feeding in federal court. In a related lawsuit, Judge Gladys Kessler granted the disclosure of videotapes of forced-feeding sessions to attorneys. One attorney described the footage as “so ‘grim’ that I had trouble sleeping.” Media groups are asking a judge to release the videos to the public, which absolutely should happen. Regardless of the ruling on the tapes, President Obama should view them and ask himself if forced-feeding is something he or the United States can condone. The military defends forced-feeding as a humanitarian measure to save the lives of detainees. The men, however, are crying out against their abusive treatment by prison staff and their unjust detention. They don’t have to be force-fed to be kept alive. The solution is for the Obama administration to: 1) order the military to immediately end forced-feeding and cease and desist from all abuse of the prisoners in its custody 2) release without delay all the men who have been cleared for transfer by the US government 3) and finally close Guantánamo, ensuring human rights and proper due process for all the men detained there. Abu Wael Dhiab is among the six prisoners whom Secretary of Defense Chuck Hagel just recently designated for transfer to Uruguay. His release would mean the dismissal of his lawsuit seeking an end to his forced-feeding. But the forced-feeding of others — and lawsuits challenging their treatment — will continue, as will the immoral and illegal detention of men at Guantánamo. We owe it to Mr. Dhiab, to those who continue to suffer at Guantánamo, and the men who have died there to close Guantánamo and newly respect the human rights and dignity of all.